The doors of Drake Circus Shopping Center in downtown Plymouth have been open for customers just over a year now. The impressive 60 800 m2 construction was built on a steep slope with an 8 m drop in level across the site, but it was still in most respects a straightforward construction venture. What made it quite different from many other projects was the structural frame. Drake Circus Shopping Center is the UK's first large-scale application of Deltabeam, and for Peikko this was the largest delivery financially to date. In addition to numerous other benefits, the use of Deltabeam enabled the contract to be completed 3 months faster than if conventional construction methods had been used. 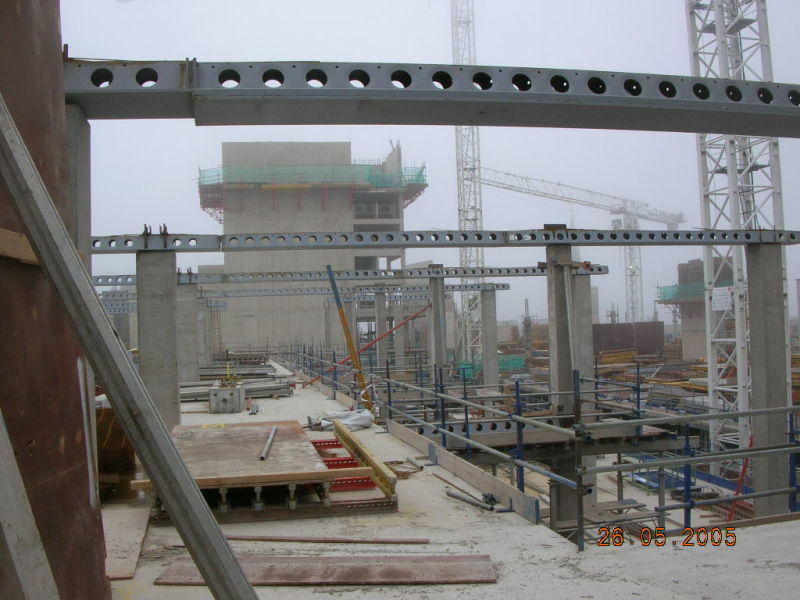 It all started in the beginning of the 21st century, when Barry Bleach from Clarke, Nicholls and Marcel, a structural engineering company in the UK, was introduced to the Deltabeam concept through Skanska with whom they were working with in the UK on another project. 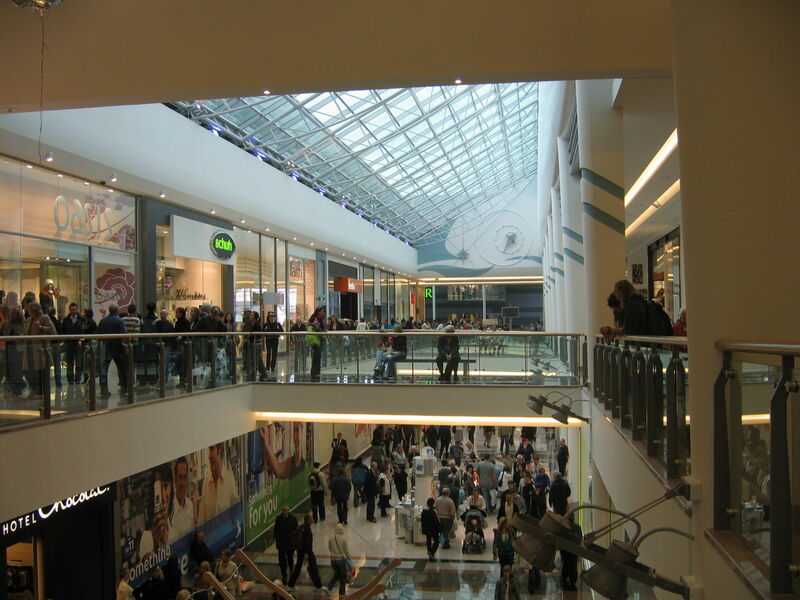 Skanska arranged a visit for CNM to Scandinavia to look at shopping centres and how the Deltabeams had been used in them. The enthusiastic group also visited Peikko's Deltabeam factory in Lahti, Finland. 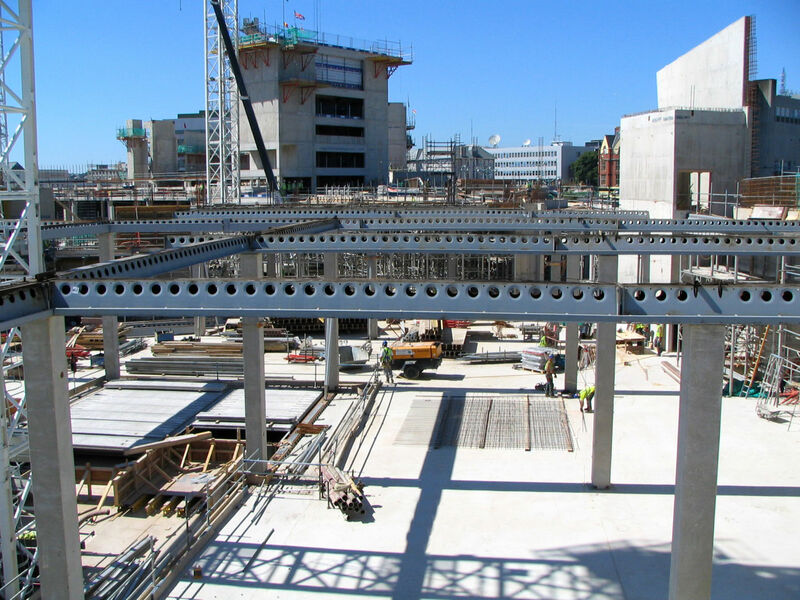 A few years later, at the time of planning the Drake Circus development, the decision to use Deltabeams was agreed by P & O Developments (The Client) on the advise of Mr Bleach, who was anxious to find a faster, more efficient method of erecting a structural frame than the traditional in-situ reinforced concrete method he would have normally chosen. 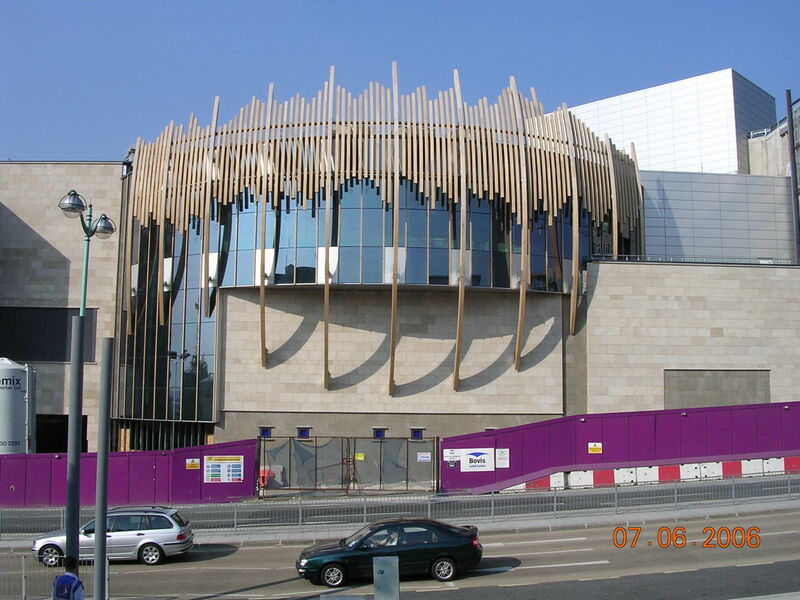 "We wanted to use as much prefabrication as possible in the Drake Circus construction due to the location of the site and the problems with obtaining labour for conventional construction. Deltabeam offered a key element in the prefabrication route for the project and had the extra benefit of offering a nearly flat soffit which would help the distribution of services around the centre", describes Mr. Bleach. "If we would have done this job with in-situ concrete we would have needed another 600 or so workers on site plus 6, 7 or even 8 tower cranes." The building plan comprised a modern shopping development with 48 shop units, restaurants, cafés, and two department stores. A new multi-storey car park with spaces for 1270 cars was also included. "The client P&O were convinced that by using Deltabeam, they would get a modern and highly functional building", says Jorma Kyckling, Sales Director at Peikko Group. The frame consists of precast concrete columns supporting steel Deltabeams, which in turn support precast concrete hollow-core Bison planks. The result is a strong floor construction with wide spans and smooth, flat soffits. Some in-situ concrete has been used, but sparingly. "Deltabeams work best on regular repeated patterns," says main contractor Bovis Lend Lease project managerSimon Allen. Bovis Lend Lease had scrutinised the Deltabeams closely, but were quickly convinced they were the perfect solution. "The remarkably long spans possible with Deltabeam are extremely desirable in a construction of this kind. In the retail sector you want nice open floor areas without lots of columns breaking it up", says Mr. Allen. The longest distance between columns is in the multi-storey car park at the western end of the site. "The floor loadings are relatively low and evenly distributed", Mr. Allen explains. "This means we could create a very open, clear space for the parking bays. We used 16 m Bison planks, so we are talking pretty hefty spans". It was no coincidence that Mr. Allen was chosen as project manager for Drake Circus. He joined Bovis Lend Lease from Skanska Construction specifically to take on this job, having previously worked on the new Met Office headquarters in Exeter. 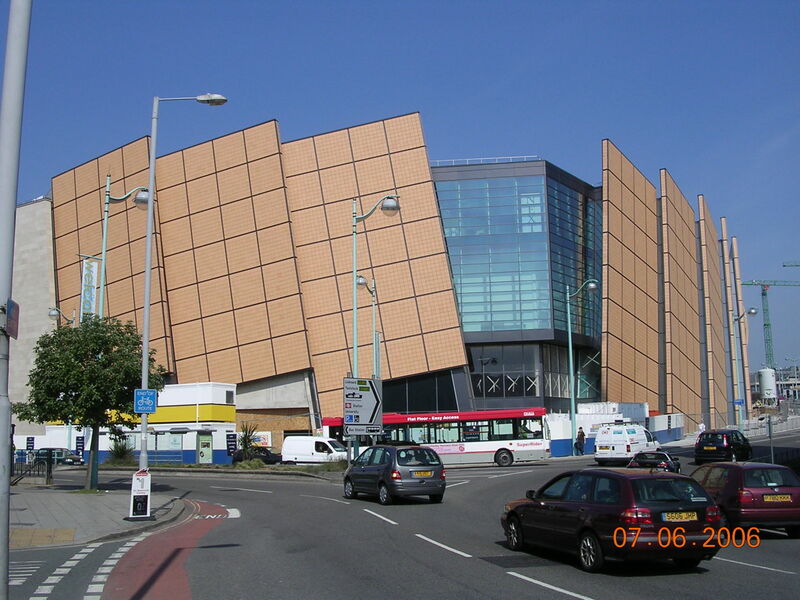 This contract, undertaken by a Skanska/Costain joint venture was, until Drake Circus, the largest building project in the UK to use Deltabeam construction. Intumescent protective coatings add considerably to the cost of steel frame, but not only do precast concrete columns require no fire treatment, neither does the Deltabeam. "All the reinforcement is inside the steel beam, encased in concrete", says Mr. Allen. Mr. Allen's enthusiasm for Deltabeam is matched by the frame contractor, Byrne Brothers. Before Drake Circus, Byrne Brothers had no experience of the Deltabeam system. Construction director Steve Lillie is today a passionate advocate of Deltabeam. "It is a brilliant concept", he says. "It is quick, efficient, and significantly reduces labour requirements." 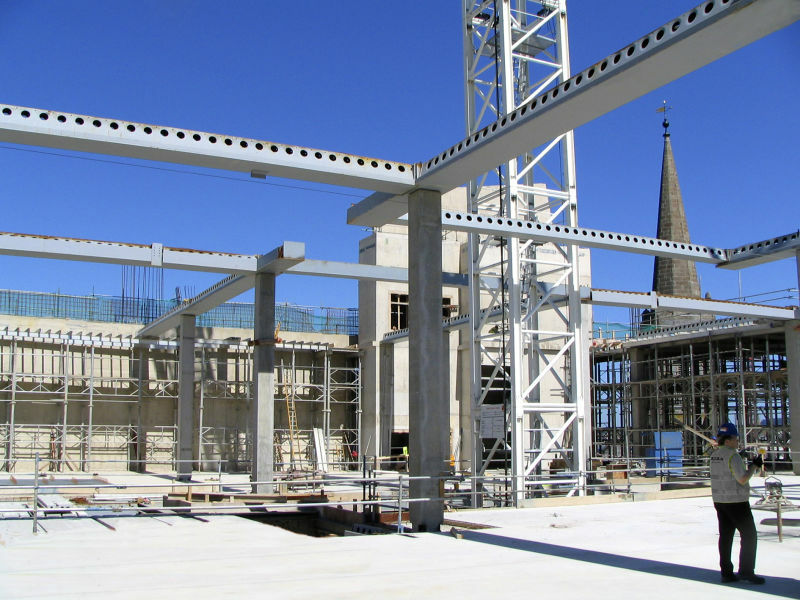 At Drake Circus, the Deltabeams are bolted onto steel connectors cast into the tops and bottoms of the precast concrete columns. The floors comprise standard concrete hollow-core planks from Bison Structures. The ends of the Bison planks sit on the Deltabeams' thin bottom flange and reinforcement is threaded through the holes in the Deltabeam before the whole assembly is filled with concrete. Finally, a 100 mm thick structural topping is cast on top of the beams and planks. The finished floor is a flat, smooth structure with only the exposed bottom flange to indicate the position of each Deltabeam. 8 km of Deltabeam was transported to the UK for the Drake Circus frame; the largest project so far in length is in Sweden, where 11 km of Deltabeam was used. For Peikko, the project was one of many challenges. It required high load-bearing capacity, very long spans and very high fire-resistance properties. There were also many new issues regarding work safety, for instance, which required much planning on Peikko's side. These included how to construct and erect railings for the work phase and how to attach safety nets, for example. The project schedule was extremely tight and stretched Peikko's delivery capacity to the limit. All in all, from the tender to the delivery of the last beam, the project lasted 36 months. 915 Deltabeams were delivered. "This commission was a learning process also for Peikko", says Simo Peltonen, Design Manager at Peikko Group. "We advanced our own know-how in design as well as production. The delivery also required investments in our production, both new cranes and roller tracks were necessary due to the exceptionally heavy weight of the beams." According to Mr. Bleach, the collaboration between CNM and Peikko was excellent. "The cooperation and assistance offered gave us much confidence with the Deltabeam system and the support details, which were also designed by Peikko." He continues to describe that the main challenge with Deltabeam is to ensure that the details are all agreed well in advance of the production in the factory. This was not achieved initially, but the situation improved vastly as the project progressed and everything was eventually completed on time. All parties involved agree that the project was a huge success. 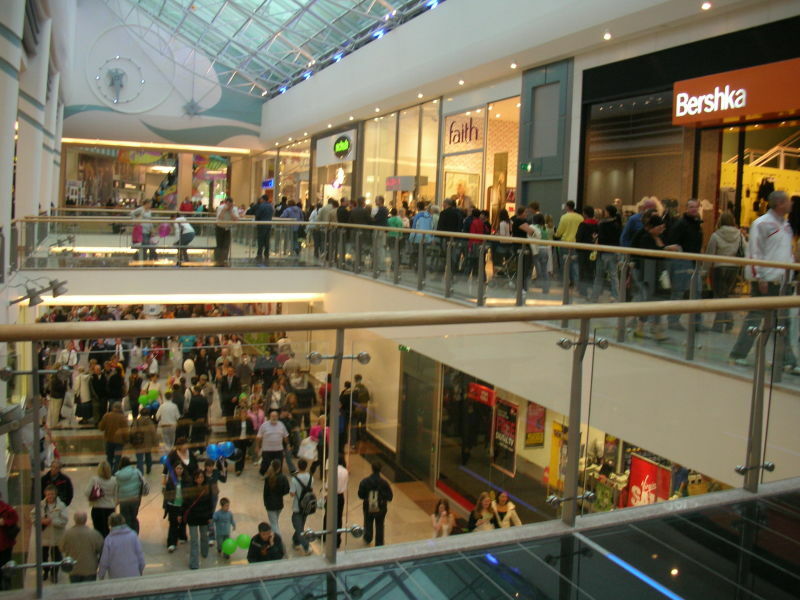 Says Mr. Bleach: "We understand that all the shoppers really enjoy the shopping centre. The element most shoppers see of the Deltabeam is in the car park and the big, open space they have for parking their cars." As for Peikko, the successful Drake Circus project quickly gained the company a couple of new commissions in the UK. Simo Peltonen has every reason to be pleased with the outcome of all the hard work. "This was really a tremendously good reference project for us and regarding the future, it would seem the sky is the limit for Deltabeam". 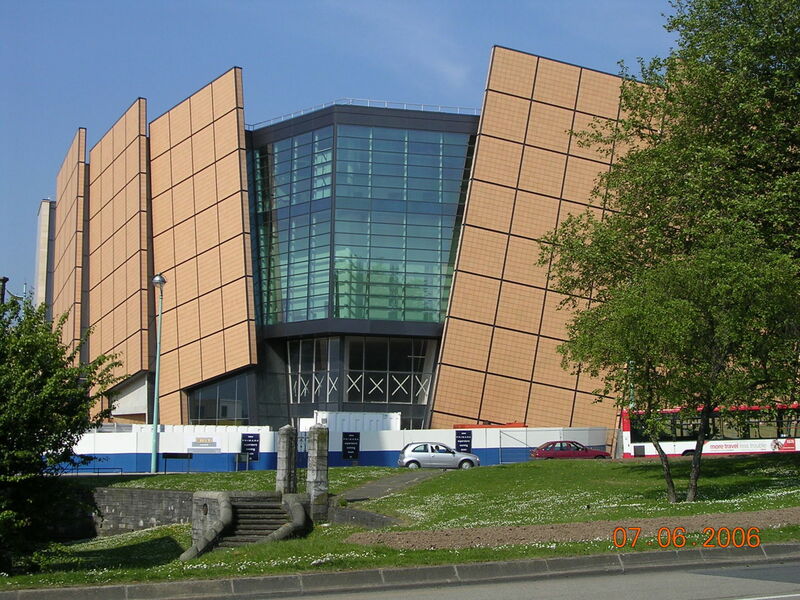 The success of Deltabeams at Drake Circus has subsequently resulted in Bovis Lend Lease teaming up with Byrne Bros. on the next project to use the same construction technique again. Simon Allen and Steve Lillie both working again with the Deltabeam.